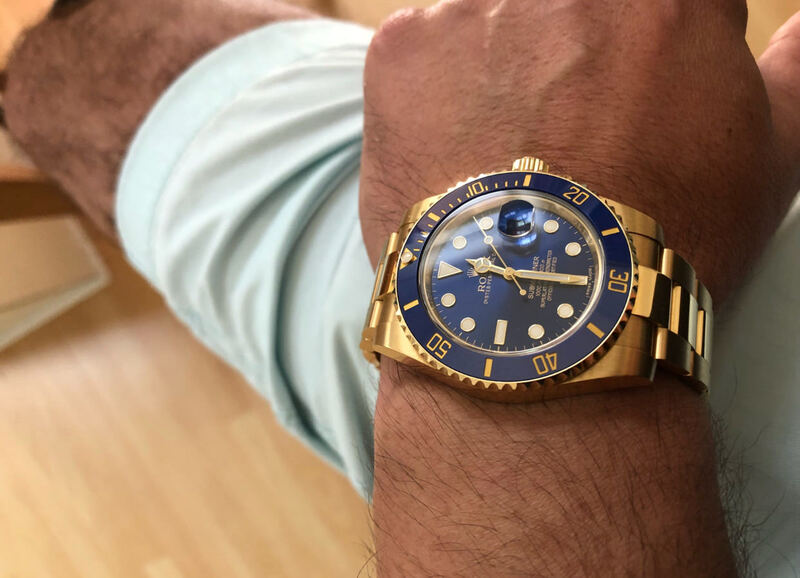 just bought the 116618LB .. very excited..
Well, after wanting this watch for decades, I decided to sell my GMT II, and some gold bullion and get this beauty.. I don't have pics, as the AD is shipping it to my honolulu address tomorrow.. I was torn between the black dial, and the blue... but that blue is so beautiful, even if a bit bling bling.. I was also torn as to get the GMT in YG, but it just doesn't feel as nice in the hand for me. I'm curious though why on the official USA Rolex website they say "Price on request" seems odd, no? Congrats, I recently went with the black dial. Both are stunning, you won’t be disappointed! Congrats! The 116618lb is a stunner for sure! I just hope I can wear it and not feel self conscious.. the PP 5711R is bling but more subtle.. Oh well, I love it, and I don't care what people think, right? congrats! I'm thinking of letting my hulk and 116520 go and getting one myself! But I'm only 21 years old so I'm not sure if it would suit me. Very young for that watch. I was in the same sitch. 19 and wanted to trade up but i ended up actually liking the TT more in person. have you tried it on? It's the case with all the PMs. They are all price on request ....how much did you end up paying OP from the 34250 MSRP? MSRP for WG subs models around 37ish, 20% would be decent discount. So much congrats, I've been lusting after the same watch as well lately! exactly.... very fair when I did some research and saw that even gray market sellers are in the 28-29K US price range. This is with an AD I have a relationship with and get my name on the warranty, worth it! Congrats! The blue dial is stunning. Excellent choice, a stunner! Congratulations! Congrats. The price on request is in US. When I am travelling to Asia or Europe, I can see prices for most PM pieces. You will love it! It is a joy to wear. Congrats! the gold blue sub AD price is 242500 in Hong Kong. didnt ask but wonder if they could offer more than 10% discount. It's a beauty, just like the 5711R, will make an awesome RG YG power pair. Great pick, congrats and wear in good health.